57 members brought their art to be critiqued by Pauline and it was, as usual, to the highest standards. Each work was assessed and critiqued in an insightful, expert and sensitive manner. 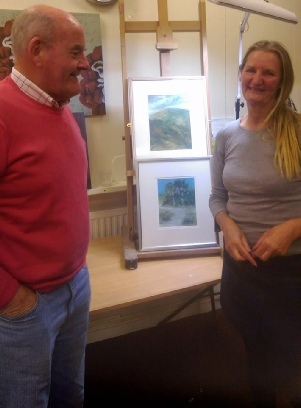 Pauline's style is gentle and informative and offered each artist her opinion on their work, and covered format, composition, mark making, colour and shape and each member gained so much from their own and each others critique. At the end of the evening Pauline chose her 'top two' ... David Harvey's beautiful and contemplative scene of a deserted road and Chi Lee's (a new member) powerful and atmospheric view from the peak of a mountain. Both were mounted and framed, and photographs did not do them justice, so if David and Chi have photos from before framing, I'm sure the members would appreciate them posting on this thread. 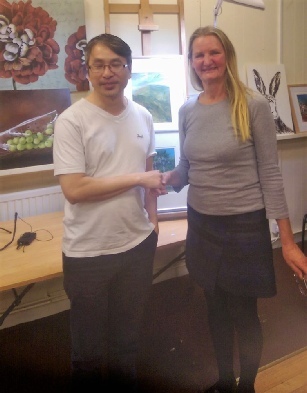 The Society would like to extend thanks Pauline for her time and expertise, which resulted in a great evening.